This is definitely one not to be missed! 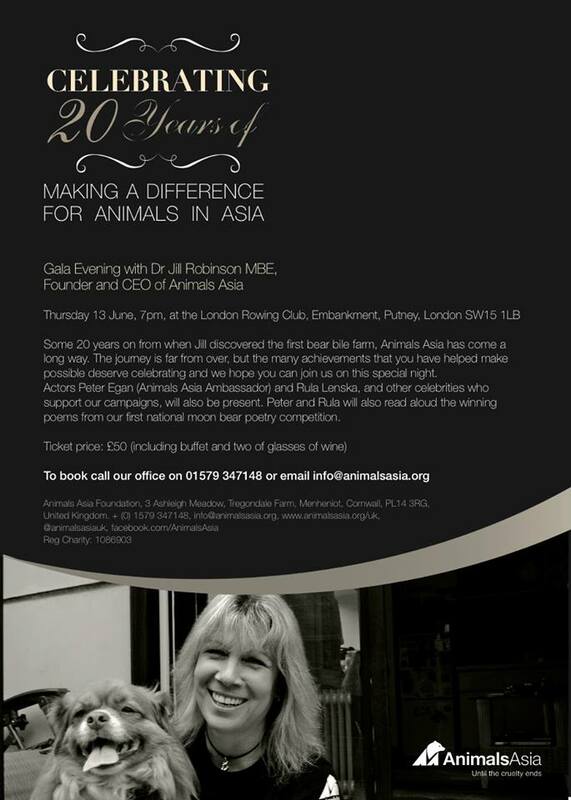 Celebrate 20 years of making a difference for animals in Asia with Animals Asia’s founder and CEO Jill Robinson. Tickets are selling fast for this event. Come and join Jill along with Animals Asia’s fantastic Patron Virginia McKenna, Animals Asia Ambasssor Peter Egan and the lovely actress Rula Lenska. As well as Jill sharing news about the bears, cats and dogs, Peter and Rula will be reading the winning entries from Animals Asia’s first national poetry contest, plus we have an auction, raffle, yummy food and a few surprises for you too. Members of the London Animals Asia Support Group will be helping on the day and we hope you can join us too.